As Hurricane Irene bears down on the East Coast this weekend, I dug up this 46-page, magazine-style report that was published by the The Bell Telephone Company of Pennsylvania1 and The Diamond State Telephone Company2 57 years ago, in the wake of Hurricane Hazel. 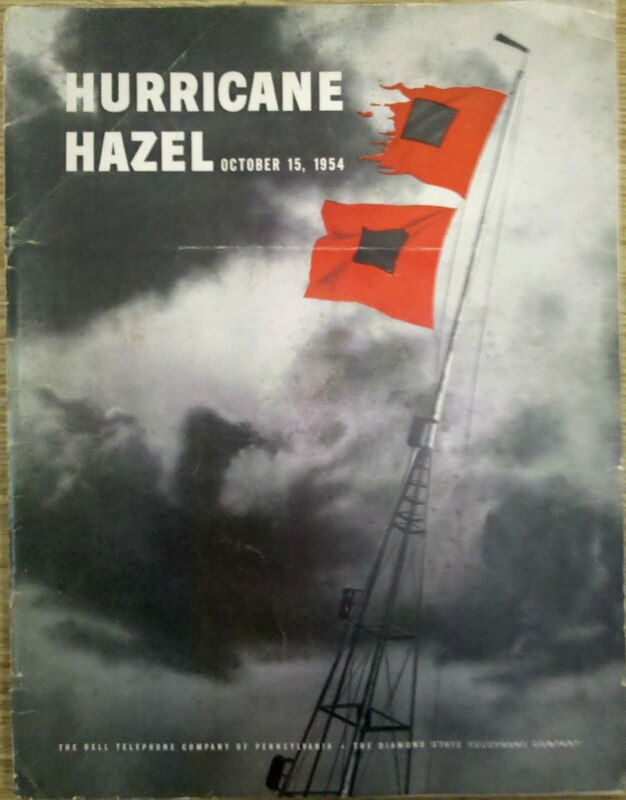 Hurricane Hazel was the deadliest and costliest hurricane of the 1954 Atlantic hurricane season. The storm killed as many as 1,000 people in Haiti before striking the United States near the border between North and South Carolina, as a Category 4 hurricane. 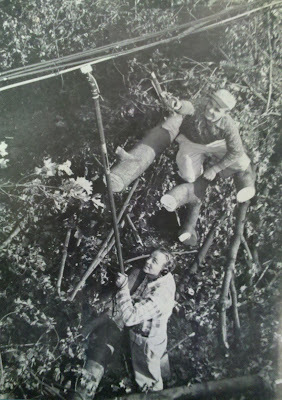 After causing 95 fatalities in the US, Hazel struck Canada as an extratropical storm, raising the death toll by 81 people, mostly in Toronto. 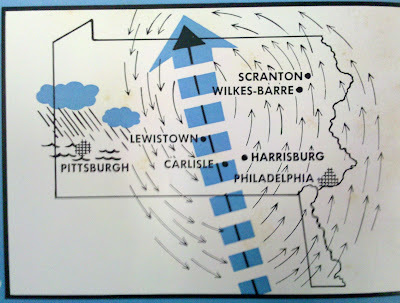 The text with that map states: "Lashing out with 100-mile winds at her baleful eye, along a path between Carlisle and Lewistown, blasting forest giants down a 200-mile corridor, ravaging with enormous damage Philadelphia's famous Main Line, grounding power and telephone wires in fantastic and perilous tangles, brushing against an east-bound cold front to deluge the Pittsburgh area with 3.56 inches of water and to flood rivers and creeks -- Hazel was one of the most ruinous storms in the history of Bell of Pennsylvania and Diamond State." 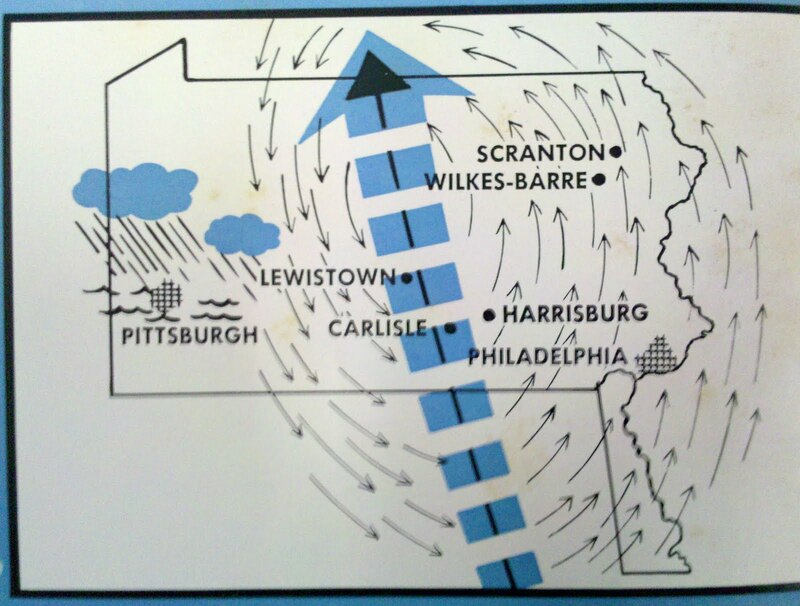 Above: HURRICANE HARRIED. 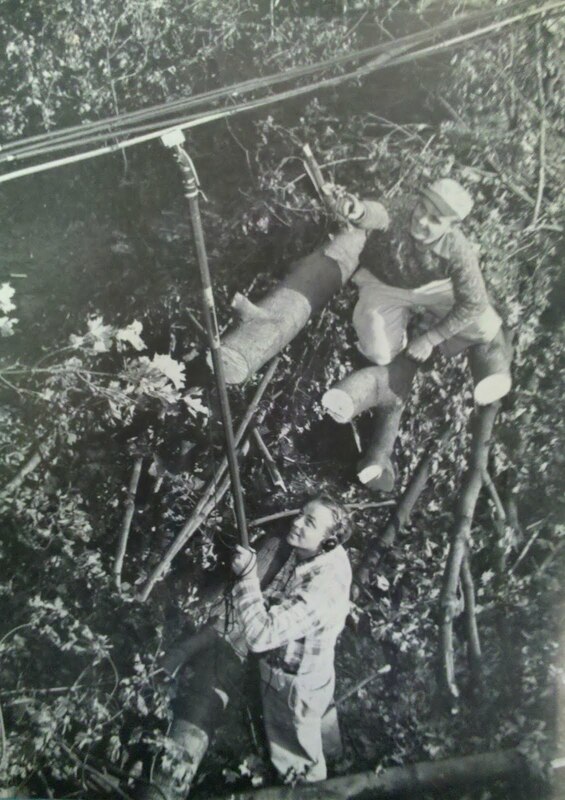 Hank Fritz (below), Cable Splicer, and Bud Butler, Helper, both of Main Line District, both veterans of 12 days in New England with Hurricane Edna, put their experience to work in their home state, as they repair Hazel damage. Above: GETTING THE PICTURE. District report center at Wilkes-Barre, one of six in Central Area, feeds information to area report center in Harrisburg. 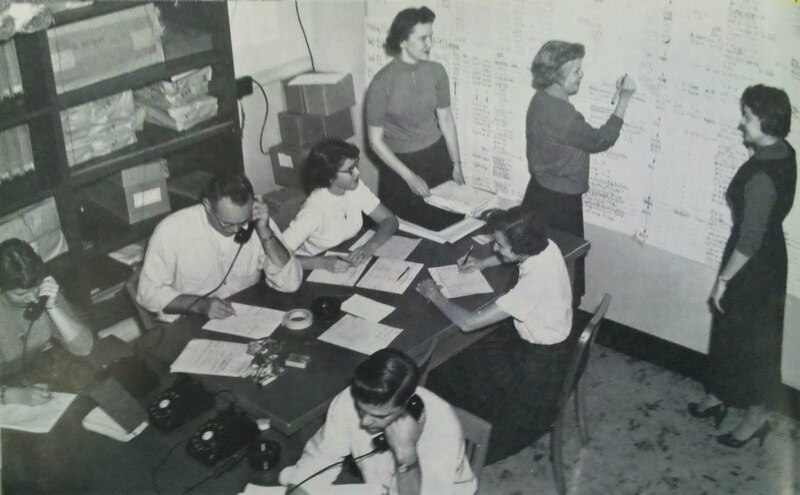 Pictured in Operation Hazel, Nancy Miller, General Clerk; Ralph Bigelow, Supervising Field Engineer; Barbara Puchalsky and Barbara Kompinski, Clerks; Elizabeth Hebert, Confidential Stenographer; Marie Trudnak, Senior Clerk; Theresa Partika, Chief Draftswoman; and Sammy Viccica, Installation Foreman. 1. The Bell Telephone Company of Pennsylvania is now known as Verizon Pennsylvania. 2. The Diamond State Telephone Company is now known as Verizon Delaware.